Coach's Corner - NFL HOF'ers group signed full-sized helmet. 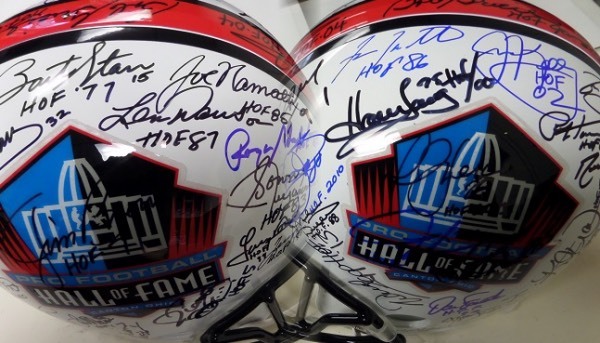 Go Back to Lot List NFL HOF'ers group signed full-sized helmet. This $3500.00 full-sized 10 is a Riddell helmet, metal facemask intact, and designed in colorful HOF logos. It comes sharpie signed by MANY, no garbage here, just HOF legends, and with names like Namath, Montana, Rice, Staubach, Franco, Fouts, LT, Emmitt, Long, Butkus, Jurgensen, Favre, Elway, Starr and many, many more. It is a true fans dream show off piece, sold here with NO reserve, and the 7th one we have sold with NO returns ever! Sure to please, and ok'd by Lee for certainty.